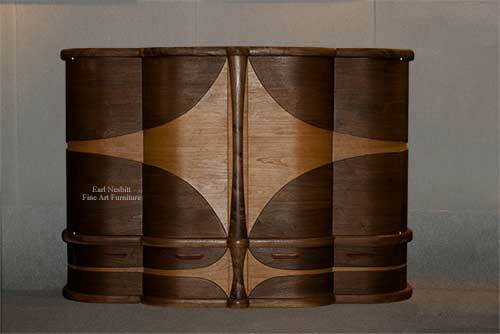 This art deco liquor cabinet was designed and handmade entirely by Earl Nesbitt. The majority of the liquor cabinet is built out of a series of solid wood bent laminations along with hand sculpted features. The cabinet is made of solid cherry and walnut with an interesting curved design. The upper portion has two center pocket doors that retract and two side doors that pivot outward. 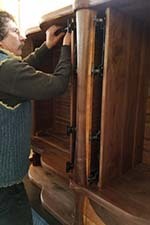 The bottom portion has curved drawers on both sides. The upper portion has adjustable shelves and pull out trays in both sides. Hand rubbed tung oil based finish. Dimensions: 75" x 20" x 50" tall. Original design with hand carved signature by Earl Nesbitt. 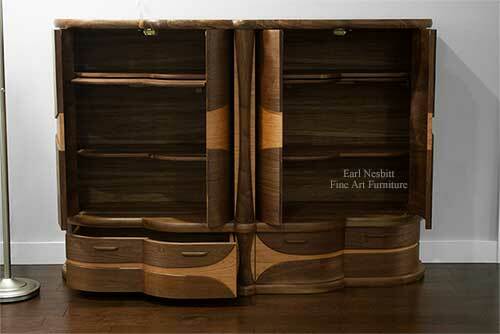 We ship Earl's fine art furniture worldwide. 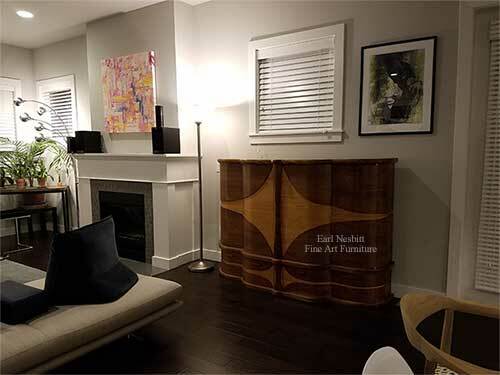 After completing a one year apprenticeship with a master furniture maker in 1990 Earl began designing and building his own custom made fine art furniture. Today Earl combines his original designs with the highest quality materials and the finest craftsmanship to create functional sculpture like this art deco liquor cabinet. With each piece he is constantly exploring new techniques to push the limits of solid wood design. Durability is of the utmost importance: this piece is built to last a lifetime. This along with limited production insures the value of this piece which has his hand carved signature and is archived to authenticate his original designs and protect the customer's investment. 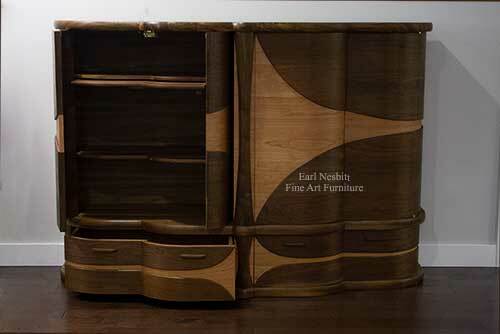 Click here to see other cabinet designs by Earl. Click here to see other designs by Earl that are ready to be shipped now. Earl sells his fine art furniture exclusively online through this website and at juried shows throughout the United States. He also enjoys the process of collaborating with a client on a custom made piece. Call or email for a quote on your own art deco liquor cabinet or other piece of fine art furniture.